WHY is This Fish THROWING UP Its STOMACH? – Catch Clean Cook – Multi Species DEEP Drop Fishing! In this catch, clean and cook video I prepare multiple species of fish from my Bimini, Bahamas Fishing trip. We did some deep drop fishing and caught a variety of deep sea species such as mystic grouper, yellow eye and queen snapper, plus a surprise amberjack. 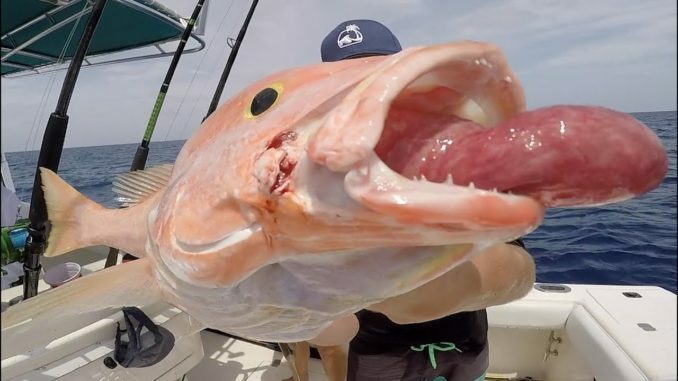 Deep water fish suffer from a not so RARE condition called barotrauma in which the air bladder of the fish cannot expel gas fast enough to meet the demands of the decreasing pressure as a fish is reeled up to the surface, and the fish end up throwing up their own stomach. I prepare 3 fish recipes using Hogfish (hog snapper), wahoo and yellow eye snapper/ mystic grouper. I made sesame crusted seared wahoo , which is one of the best tasting fish for a seared fish recipe. Underwater Video! Do Bass Eat Bluegill Swimbaits? Free Diving While Fishing Clear Water Lake | GIANT BASS FOUND!